he Boiler Blast is an annual event organized by the Boiler Volunteer Network (BVN) at Purdue University on their main campus in West Lafayette Indiana. SpringBlast is a day of service dedicated to serving our neighbors. Our goal is to connect Purdue students and residents in making a more united community. SpringBlast was established in order to make that possible. This year, to guarantee that we can get to all of the residents on our list, we hope to work with folks who live within a 15-minute drive of Purdue University’s campus. Please let us know if you need accommodations! You will hear back at the end of March about what time to expect volunteers day-of! 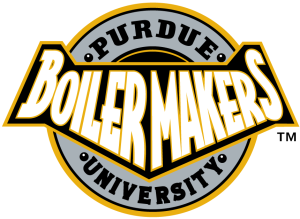 Please contact our student Community Partner liaison at bia@purdue.edu with any questions you might have! Hello and Good Afternoon Friends in Greater Lafayette/ Neighbors! I hope this email finds you well. We are emailing you as a part of Boilers in Action, a student program that trains students to coordinate meaningful community engagement. We are coordinating SpringBlast, a program you have participated in with Purdue students in the past. As a previous participant we would like to extend the offer to participate again! This year (2018) SpringBlast will be on Saturday, April 7th. More information will be given closer to the event, with the goal that we make this process as easy and clear for you as possible. Please use the Google Survey below to sign-up, or email us directly if you prefer. You will receive a follow-up email with more information the week of March 7th. I am excited to announce that this year’s Spring Blast Resident Registration link is officially live! Spring Blast has been previously known as Boiler Blast and Springification, but the day is all the same. Spring Blast is a day of service dedicated to serving our neighbors. Our goal is to connect Purdue students and residents in making a more united community. Spring Blast was established in order to make that possible. As a previous participant we would like to extend the offer to participate again! This year (2017) Spring Blast will be on Saturday, April 1st. To register, follow the link at the end of this email, fill out the form, and you will be all set! We will be contacting you about 2 weeks before the event on April 1st with more information. Please be honest about your needs so that we can match you accordingly. If you have any questions, feel free to contact jones973@purde.edu. Thank you for your participation! It’s that time of year to get your yard and house ready for spring. 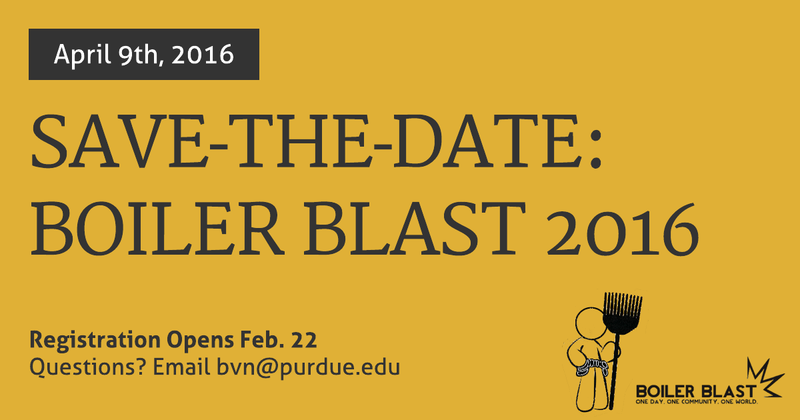 This year’s BoilerBlast will be held on April 9th, 2016 from 8am – 12pm. If you are unfamiliar with this program, it is an opportunity for residents and Purdue students to work together to improve the quality of life in our neighborhoods, parks, and around our homes. If you would like to work with Purdue students to help you prepare for spring, please signup online. Availability is on a first come, first serve basis so sign-up now. We are also working with the Civic Engagement and Leadership Development group to also help clean-up our streets, sidewalks, and parks. You can also visit the BoilerBlast 2016 web site for more information. If you looked out your window or went for a walk around our neighborhood on the morning of Saturday, April 5th, you would have seen dozens of Purdue students (thanks to the Civic Engagement and Leadership Development), working alongside neighbors, to get the streets, sidewalks, yards, and alleys in a better state for the upcoming Spring season. 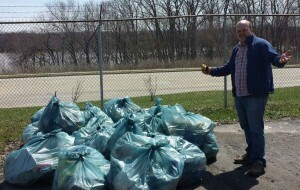 One component that weekend was the annual CleanSweep program. 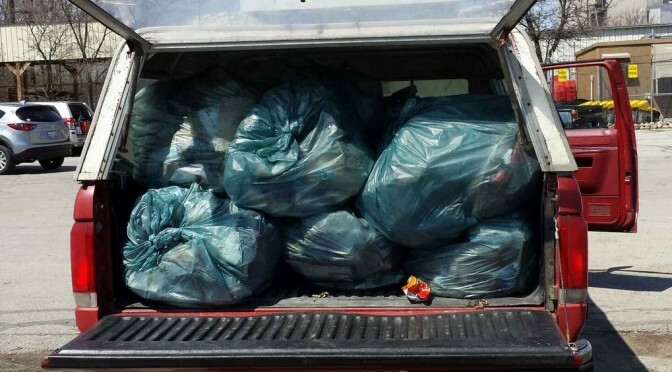 We picked up over 21 bags of garbage (thank you Jeff for the truck!) 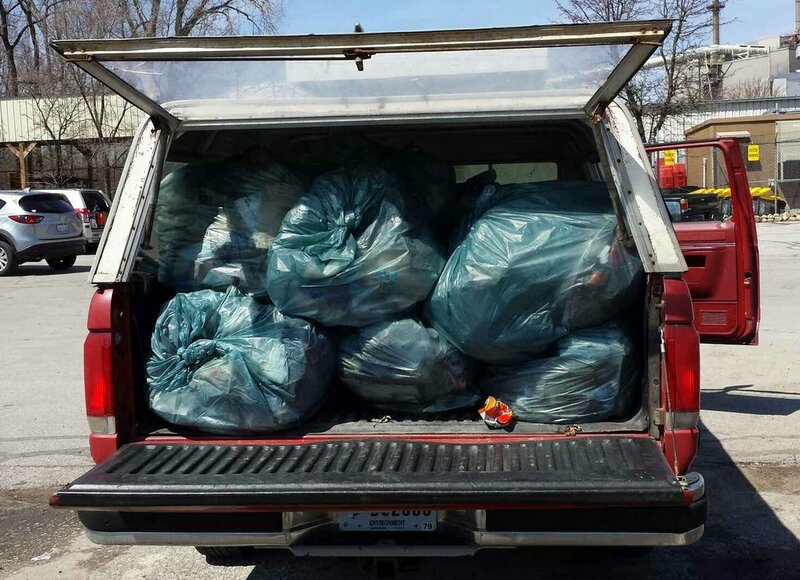 and thanks to the West Lafayette Street and Sanitation Department, we disposed of them safely. Thanks to everyone who helped make this neighborhood collaboration with Purdue University and the City a huge success. We are working with the team at Purdue to make it even better. If you have any thoughts, please send them our way. Make sure to get your Boiler Blast job requests in as soon as possible. What’s Boiler Blast you say? Boiler Blast is organized each year by the Civic Engagement & Leadership Development (CELD, formerly BVN) and gives Purdue students an opportunity to give back to the community by providing volunteer service. The students have a good time as they give neighboring areas a little TLC. It is a big win for everyone. This year, the Boiler Blast Committee goal is this year is 1,500 students and 200 resident participants, so they will have a lot of students ready to help you out. Boiler Blast will take place on Saturday April 5th, 2014. You can expect the students to start arriving in the neighborhood after 10:00 or so. Submit your job request today! Also, we need a pickup truck (any size will do) to collect the bags of debris the students will leave on corners in New Chauncey. This is a two person job (a driver and someone to help grab the bags and put them in the truck). This is about a 90 minute job start to finish and is done sometime in the early afternoon. Again, please let us know if you can help us out with this small task. The 2010 Boiler Blast as a great event for the City of West Lafayette, the Purdue Students who participated and the New Chauncey Neighborhood. The kick-off is held on the Memorial Mall. The event, organized each year by the Boiler Volunteer Network (BVN), gives Purdue students an opportunity to give back to the community by providing volunteer service. The students have a good time as they give neighboring areas a little TLC. It is a big win for everyone. Projects the students tackled this year included a large hillside of leaves, the Day Lilly beds in the New Chauncey Neighborhood, collection of scrap concrete and debris from neighborhood ally ways, and of course the favorite “window cleaning” along with dozens of other jobs and tasks requested by the City and neighbors of Purdue. Students either walk to the job sites or hop the Purdue Bus and get dropped off nearby. The students help the City, residents, neighborhoods, the Lilly Nature Center, and various other parks and locations. Students gather at Purdue’s Memorial Mall in preparation for Boiler Blast. When Boilers Give Back West Lafayette! The Boiler Blast, an annual event at Purdue University, has a whopping 1,020 Boiler students give back to the community by volunteering to do odd jobs for the residents of West Lafayette. Piazza Produce, WAZY 96.5, College Station, Purdue Gear.com along with many of the great student organizations on campus. New to this year’s event, thanks to the terrific organizing committee, each home that had signed up for student volunteers, was “tagged” with a bright yellow sign so the volunteers could locate their job sites. These signs were posted the night before the event and helped to smooth the days events. After meeting at the Campus Mall, the students either walked or were shuttled to there assignment locations. In the photos below, student received maps for their assigned areas to clean up, trash bags, and gloves. Then they were off to work. The students came from all over campus, residents halls, fraternities, sororities, clubs and other campus organizations – all came to help out and the New Chauncey Neighborhood greatly appreciates their efforts and willingness to help out. NCNA Leadership Team member Vicki Leavitt talks with Boiler Blast Volunteers about their assignments and provides the necessary supplies. Throughout the morning and early afternoon, students could be seen walking the streets and alleys cleaning up the area and having a good time. The best part of the day was the joy both the Boilermaker students and the New Chauncey residents received from the volunteer spirit. It was truly another win-win put on by Purdue. There were other projects that the students helped out on including mulching neighborhood garden spots, cleaning windows, raking yards, planting trees, and installing a retaining wall with one of the residents. When Students Give Back West Lafayette! Boiler Blast is an annual event at Purdue University where students give back to the community by volunteering to do odd jobs for the residents of West Lafayette. 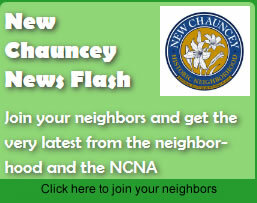 The New Chauncey Neighborhood residents ask the student volunteers to help with area clean up, spring yard work, window cleaning, and even some light construction work for the Unitarian Church. The 2008 event was a great success for the students, Purdue, and the New Chauncey Neighborhood. Many thanks to all who organized and participated in the event! Bags of trash at main intersections throughout New Chauncey were a common sight before noon as the NCNA Clean Sweep powered by Purdue’s Boiler Blast was in full swing.